I remember hearing a quote somewhere to the effect that gardeners make plans, but Mother Nature has other ideas. The real significance of that was brought home in spades by the shambles Superstorm Sandy made of our garden, which was completely inundated and buffeted by aerosolized salt air and high winds, at least 32 species of plants disappeared permanently. Others barely survived and continue to struggle to regain their former glory, which may not be possible for some and is taking a long time for others. Dwell no more on loss! That’s been my mantra, though I still mourn, among others, the graceful Japanese anemones that brightened the shady areas and the Harry Lauder’s Walking Stick—you will see his remains repurposed as a bird bath. They will not be replaced for fear of a repeat performance by Ms Nature. Another complication of the storm is a new layer of consideration that enters into every plant purchase. High salinity, whether from water on the ground or aerosolized salt, affects plants in several ways: water stress, ion toxicity, nutritional disorders, oxidative stress, alteration of metabolic processes, membrane disorganization, reduction of cell division and expansion, and genotoxicity; these effects reduce plant growth, development, and survival. An additional consideration is that genetic variations in salt tolerance exist, and the degree of salt tolerance varies with plant species and varieties within a species. That could explain why my neighbor’s Kousa dogwood right across the driveway from mine survived and recovered the year following the storm while ours did not. Another anomaly showed up in our Forest Pansy redbud tree. It appeared dead after the storm, but, as with many other victims, I waited until the following year to declare them DOA. The Forest Pansy was truly dead, but before too long began to sprout multiple stems from its base. The new tree is not a Forest Pansy, but a regular redbud, Cercis canadensis; The Forest Pansy is produced by grafting part of the cultivar onto a C. canadensis seedling. Gone are the days of carefree plant shopping when all you needed to know was on the label: size, spacing, sun or shade, watering requirements, soil preference, and zone. Still, I can’t help asking myself when I covet a plant that’s iffy on the tolerance scale. Perhaps there won’t be a next time. Should I take the chance? I am also removing undesirable invasive alien species from the garden, most notably English Ivy (a loooong way to go) and Wintercreeper Euonymous (second year working on that). The Japanese Barberries, all the loosestrifes, and several others are gone or still in progress. These and other species are on the no sell, no buy New York State and Long Island lists. When we came here 19 years ago there was no landscaping to speak of except grass and a swing set. It was June and we’d left behind established gardens so we set out to immediately create another garden. Tony had a bobcat and we trucked in and spread 60 yards of compost enriched top soil to make the garden directly behind the house. (Remember, we were 19 years younger) Over the years that garden soil has been further enriched with chopped leaves, seaweed and compost. As a result it requires much less watering than other areas of the property which have not been treated as well. Initially that was planted with perennials, many and varied and I must say, shamelessly immodest, that it was a glorious sight. 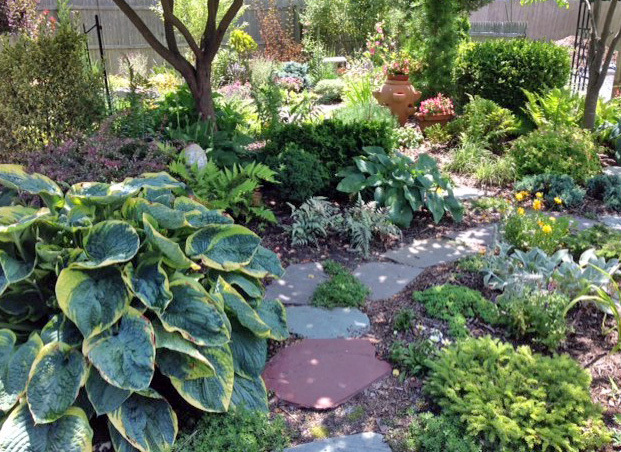 However, to keep a garden of perennials looking well groomed requires a great deal of work, so over time I replaced many of the perennials with trees and shrubs which are less labor intensive. Last year I enlarged and reshaped that garden replacing its’ mature aspect with that “new garden” look- raw and stiff. I’m required to exercise patience waiting for it to soften and settle over the next few years. The Redbud trees in this garden were bought at end of year sales at Lowes, as were other trees and shrubs on the property. The garden in the front of the house was created after Sandy destroyed all of the Pachysandra there. The Hostas there are now as big as shrubs and there is a plethora of ferns which I cull and share with friends on an ongoing basis. Over the years I have transformed many areas on the property from more labor intensive to less labor intensive keeping in check my desire for more and more beautiful gardens. “Garden Creep” is definitely a problem for me. The garden on the west side of the cottage near to the dock is in its’ third year, is somewhat “wild” and doesn’t get all of the attention it should. This year, however, I have been battling chick weed there. Of course, my gardening pleasure is doubled by having a gardening friend next door. Over the years Karen Ferb and I have inspired and encouraged each other in our gardening efforts. “Slow and steady wins the race” is our frequent reminder to each other when the work seems overwhelming. Please feel free to stroll down to the water. Thank you for visiting my garden. My husband Rich purchased this house and property approximately 35 years ago. It was a tiny house on top of a steep hill. Rich leveled the bottom section, which turned out to be all sand underneath. He then installed planting beds using railroad ties and brick to make steps to the top section. He met the woman of his drams 27 years ago. We were married on this deck on West Lake. We planted many plants and flowers in the beds for this joyous occasion. The house became a home! The garden became a “garden of weeden” (weeding). Many years of weeding and planting, weeding and planting went by while children rode their sleighs and snowboarded down the snow covered steps onto the deck or, when frozen, onto the lake. Hurricane Irene took our oak tree north of the garage. That oak was an anchor for the children’s zip line as well as shade and peace for our lazy hammock. Many turtles and ducks laid their eggs. Trying to copy nature, our daughter hatched duck eggs in an incubator. Our family was growing! Our yard also became a home to ducks, dogs, rabbits, birds, lizards, guinea pigs, bearded dragon, and a cat. After making our house larger for our growing family, Rich built a dollhouse-fort on the upper section. He then decided he needed a garage. He rolled the dollhouse down the hill on logs, then built our garage. Time goes by quickly, and the children were now ready to get married. The railroad tie steps, now 30 years later, were rotting. We replaced them with stone, and our daughter Sarah was married to Brenton on the same deck where we said our vows. 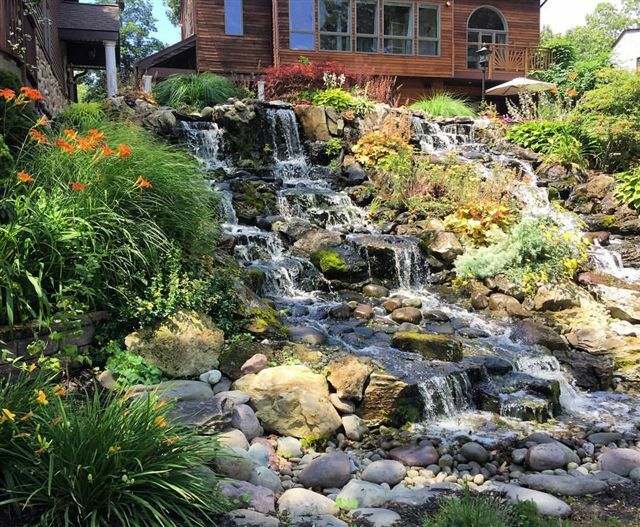 Next the weeding flower beds were replaced with a waterfall. Our son Peter asked Irene (hurricane) to be his bride; they married on the same deck in our backyard garden. This past month we celebrated our daughter Sydney’s college graduation with many family and friends. Over the years we planted hollies and hostas, tiger lilies and hydrangeas, rose gardens, berry bushes, and a fruit tree that was supposed to be a peach, but turned out, I believe, to be a pear! Our garden of “weeden” has slowly disappeared. We have been blessed with many years of hard work and discipline, and our garden and children have all grown beautifully! We are blessed and hope you enjoy what God has done here! It all started way back when, who wants to admit how long ago. When I was a kid my father received a “Best Yard” in the neighborhood. In those days, what did I care? I wanted to hang out with my friends, I hated plants! All I know is that we kids had to help weed and pick the Big Horn Tomato worms off the tomatoes. And we weren’t allowed on the front lawn! Even though I learned a few things, I thought I am not going to have those plants! Little did I know that I would become obsessed! I started off with vegetables and fruit trees. I figured it was good for the kids and no chemicals! I have collected many really cool day lilies, from early, middle, late bloomers, ruffled and awesome colors. We have many roses-love them-hate the thorns -we don’t spray, so that can be a problem with disease-look for disease resistant! Everytime I get stuck with them, I think-that’s it! Getting rid of that one, but I get over it after the bleeding stops and the swelling goes down! We have some great evergreens: Weeping Norway Spruce, weeping Atlas Cedar, Hinokis, Drodar(? ), and others. We have many perennials: phlox ,peonies, cone flowers, epimedium, spurge, coral bells-just to name a few. We have 2 ponds. One has a mosaic walk around it,that we put in about 10 years ago. Boy! What work that must have been-crazy and younger and that time! But glad we did! We made stepping stones to match, the next year. We have a shade garden with some really cool hostas (they get a bad rap),lady bells, ferns, hellebors and more. 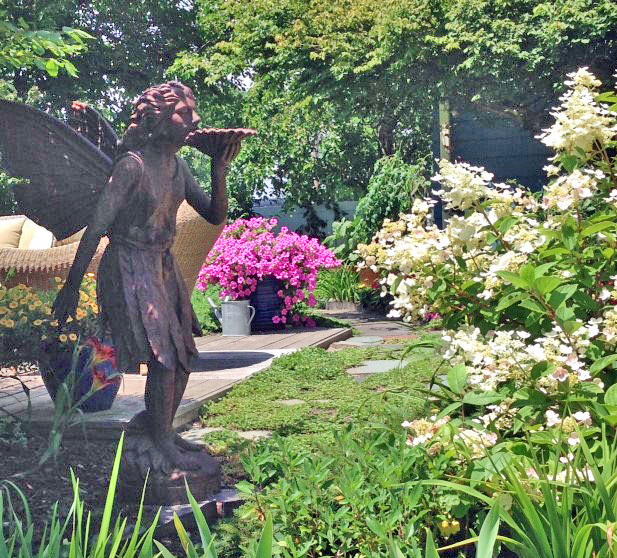 There are water features around the yard and statues and things of art. 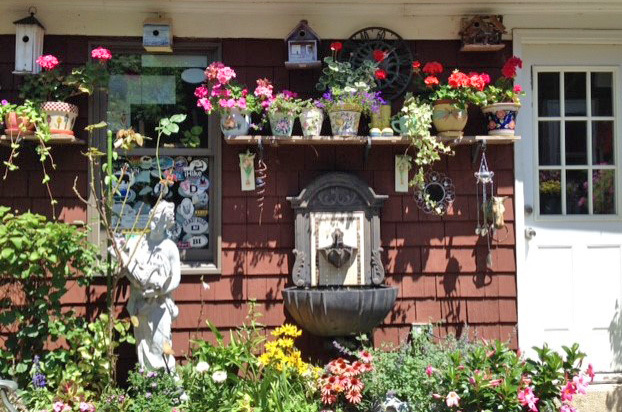 We have a courtyard with a lot of potted plants and bird houses. I am in the Dahlia Society and have about 200 dahlias, though thet all may not be blooming yet. We have raspberries, blackberries, grapes, blueberries. Every year we change something! We do love it though the backs and knees don’t. We collect old tools and they are around the yard or hanging somewhere. We enjoy the birds and grow plants for them. We hope you enjoy our yard as much as we do. Established in 2012, the mission of the Patchogue Community Garden is to enhance the quality of life for the people of the Village of Patchogue by creating and preserving a beautiful green space in which residents can grow organic vegetables, flowers and fruits; produce nutritious food for the local food pantry; cultivate community; and become more educated about environmental sustainability, responsibility and organic gardening. We are located behind the Patchogue Village Parks and Recreation Building at 380 Bay Avenue. For a $25 or $50 fee and small deposit, members are granted half or full beds which can be planted as desired within PCG’s rules & regulations. Members are entitled to harvest & keep all their produce as long as the bed is kept up & harvested regularly. Members are also required to volunteer several hours a month to maintain the community garden &/or help with the planting, harvest & upkeep of food pantry beds. During the 2016 growing season, with the assistance of several generous community sponsors, PCG members were able to plant, maintain & harvest over 2000 pounds of fresh produce for the food pantry at St. Paul’s Episcopal Church. 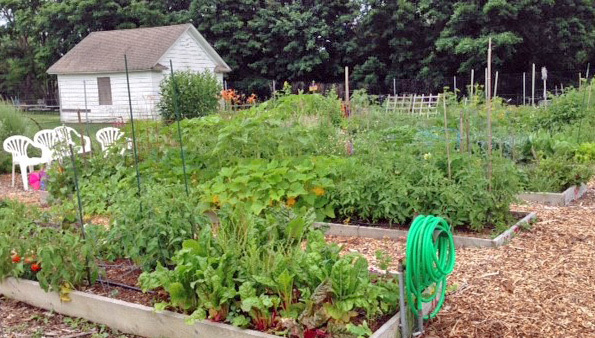 For more information, please contact Diane Butler at 516 318-7962 or email us at patchoguecommunitygarden@gmail.com.